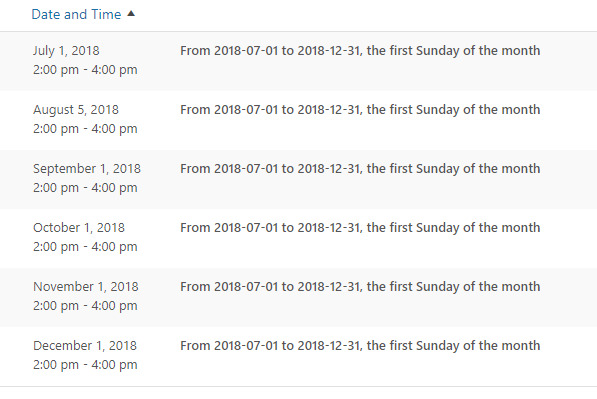 A client of mine has been using your plugin for a few years and recently noticed that saving recurring events to the 1st Sunday of the month no longer work. Instead the event is saved for the 1st day of every month. It shows as the first Sunday of the month in the admin but on the calendar it shows as the 1st day of the month. Having the same issue here. Happens specifically with monthly recurring events. Weekly recurring work properly. Monthly all show on the 1st each month regardless of the settings in the recurrence pattern. I have 3rd Thursday and 1st Monday events and they all show as June 1, July 1, August 1, etc. making this unusable. this issue has been reported before however we can’t able to replicate this; can I know your timezone settings and did you already check option under Events > Settings > Admin Tools > Reset Timezones ? The WordPress Time zone is set to Vancouver. The Events plugin setting (under general) is set to Vancouver. I took a look at Events > Settings > Admin Tools > Reset Timezones and this also says Vancouver. This plugin has been working fine for them for a couple years before this. I just installed the plugin on another site and it’s working fine there (also rules out user error in entering the recurring event details wrong). Do you have any other suggestions of what I can check? I have exactly the same problem. Existing monthly recurring events are showing fine but if I make a change or create a new one then it’s the same as you. This is going to be completely unusable soon as we have dozens of monthly events (church site) that need to be recreated. The lack of response is annoying even though I know the developer wasn’t able to recreate the problem but some communication would be welcome. @patsky, Thank you for your suggestion and testing of your proposed solution/work-around. I may have to move to a new events management plugin as well. I was hopeful that your work-around would work, but this is sad news. It appears from this layman, that this would be a simple fix given all the other development they’ve done. I tried looking in the documentation, and didn’t see anything there. Succes in finding the problem. Thanks Peter, however when you alter a recurring event, all the old entries are deleted and new ones created. I will take a look though and see if there is anything obvious. Disappointing still no input from the plugin author. My client has renewed their pro subscription in order to post this problem on their pro support forum. If they or I come up with a solution I will post it here. @createscape Thank you. That would be very helpful. @psmits1567 as per my reply on the other thread, I did identify differences in fields that weren’t being populated but they seemed imsignificant as weekly repeat events didn’t have them either and they were working fine. The issue have already been submitted to EM. I’ll update this thread when the issue is solved. Thank you very much for your help. I updated the PHP version to 7.1 (hosting plan didn’t offer 7.2) and installed 5.9.5.1 dev version of this plugin. I’ve tested the recurring events and it works fine now. Thank you for finding the solution. The topic ‘Recurring event saved for First Sunday shows on 1st day of the month’ is closed to new replies.